Every Passover I try to come up with a new spin on traditional dishes. 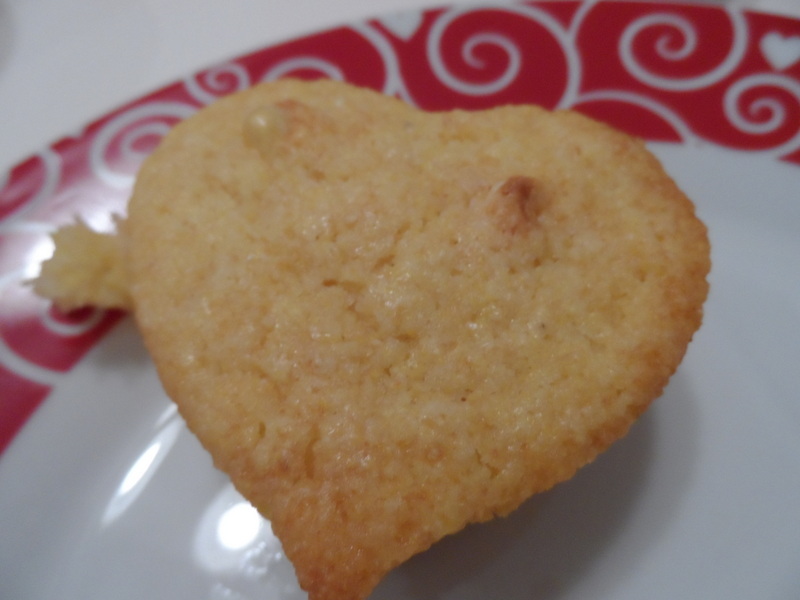 Here is one I came up with for a cooking class that I taught a few weeks ago. I wanted an entree that screamed Spring, but whispered Passover, and this was the perfect thing. Preheat oven to 425℉***. Line a baking tray with foil. If the salmon doesn’t have skin, spray foil with cooking spray, but if it does, then don’t. Place salmon on baking tray and sprinkle with salt and pepper, to taste. Add dollops of mustard and spread evenly over the salmon. On a cutting board, place the herbs, garlic and lemon zest and finely mince. In a bowl, mix the chopped herbs, garlic, lemon, zest, and matzah crumbs. Add the lemon juice olive oil and stir well. Spread the mixture on top of the salmon and bake for 18-20 minutes. 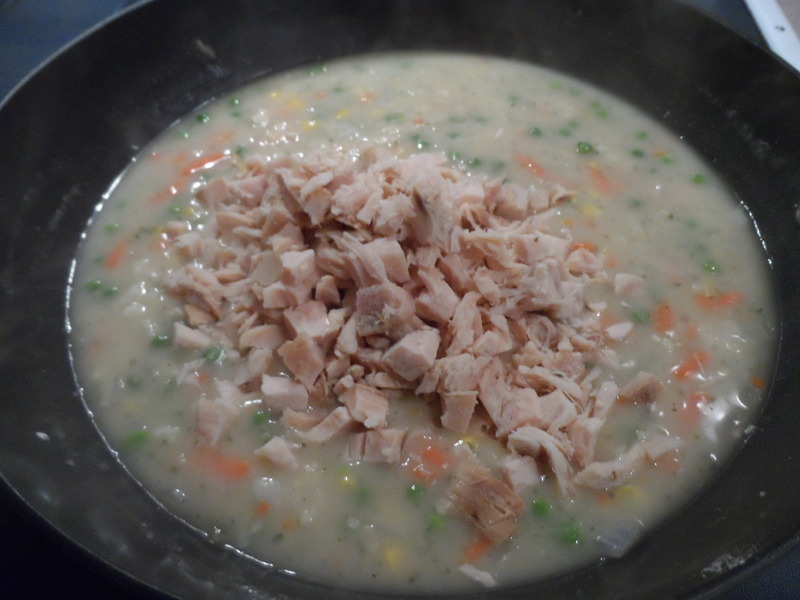 *You can use chicken breast instead of salmon. Bake at 400℉ for 30 minutes. 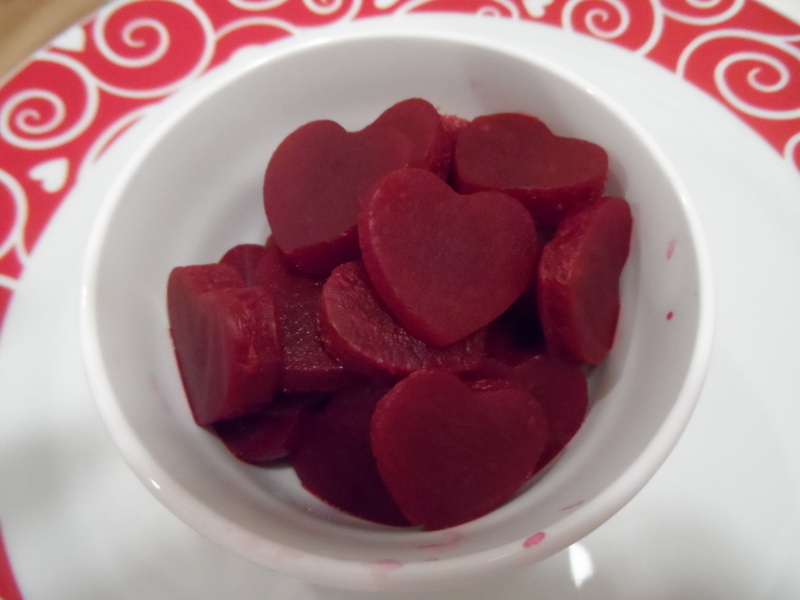 **You can use Manischewitz Creamy Horseradish Sauce or combo of mustard and mayo. ***If using wild salmon, reduce cooking time. Snow day has followed snow day, and frankly I don’t mind a bit. The icy roads and sub-zero temps have given me permission to stay home with my family in my cozy house and cook. The biggest challenge on those days is to decide if I will put on clothes or pajamas after a shower, and pajamas always seem to win. 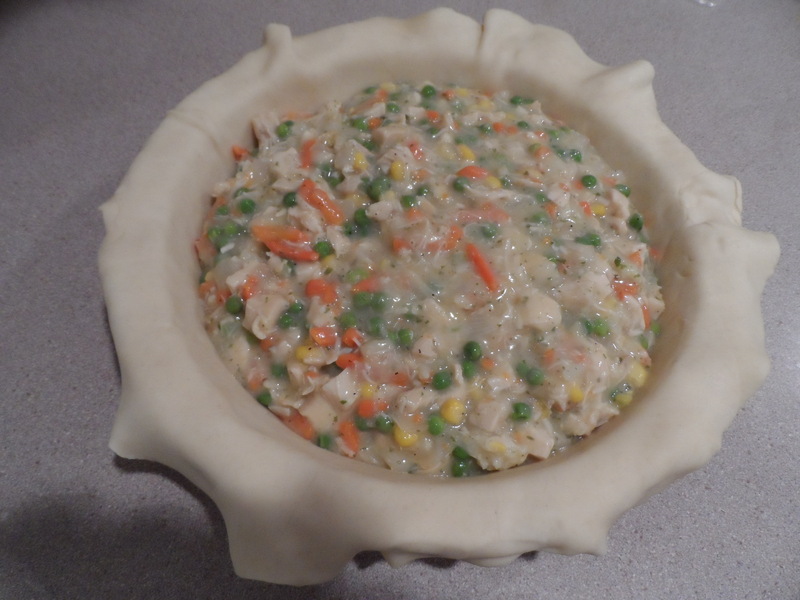 Comfortable clothes lead to comfort food, and this chicken pot pie is an old favorite. 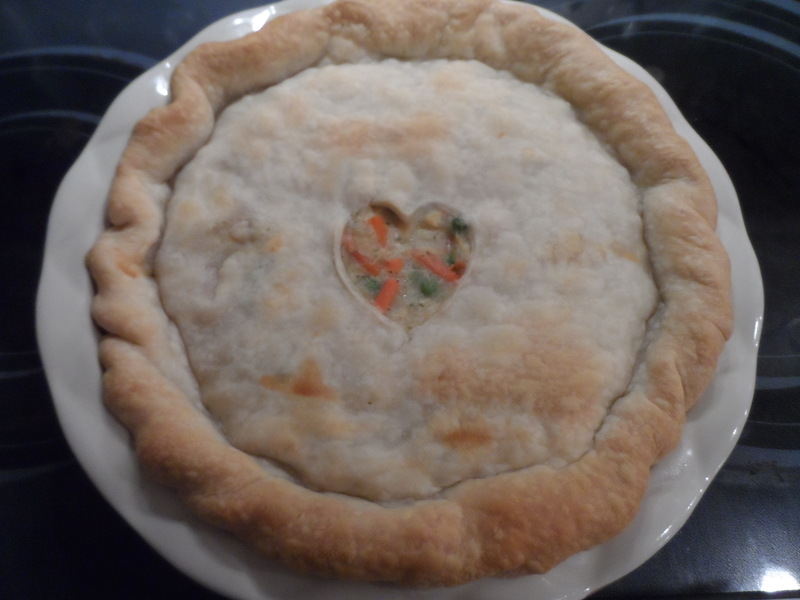 There are varying degrees of how challenging this recipe can be—sometimes I make my own crust and add wine and a bay leaf to the filling ( ask me if you want to know when to add what), other times I use store bought crust and frozen veggies. It all depends on how much effort I feel like putting into it, and honestly, it is always delicious no matter which way I choose to go. 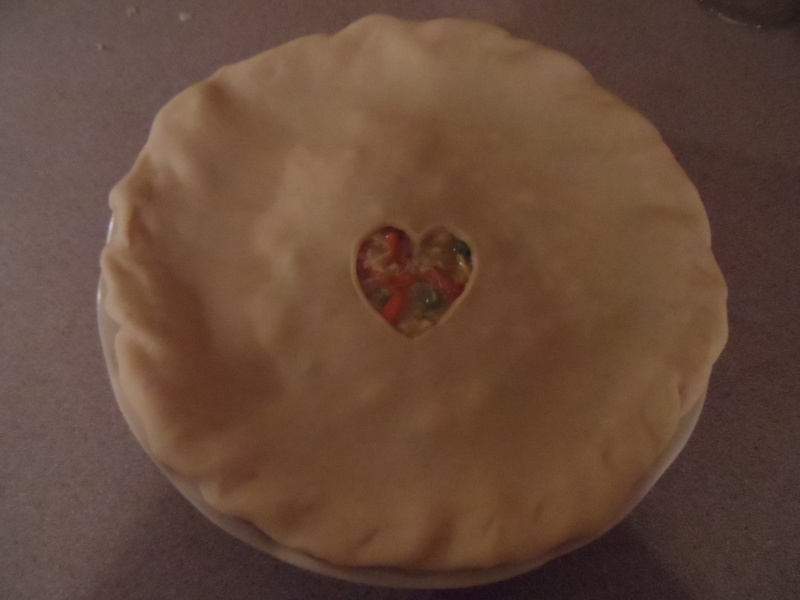 I will give you all of the variations and you can decide for yourself the next time you are snowed in, whether to put on pajamas or clothes, or make or buy a pie crust. Comfort food equals comfort cooking, so have it your way. I have made this when company comes, when bringing dinner to sick friends, and when I have bits of this and that leftover in the fridge. It never disappoints, so if winter has you down, this will pick you up! 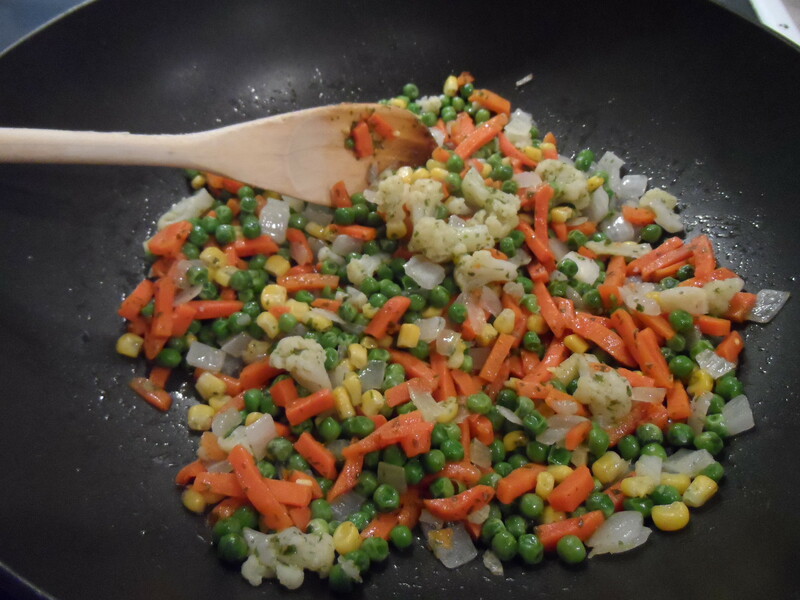 For the veggies: 1 diced potato or 1 cup chopped cauliflower florets, ½ cup diced carrots, ½ cup frozen peas. 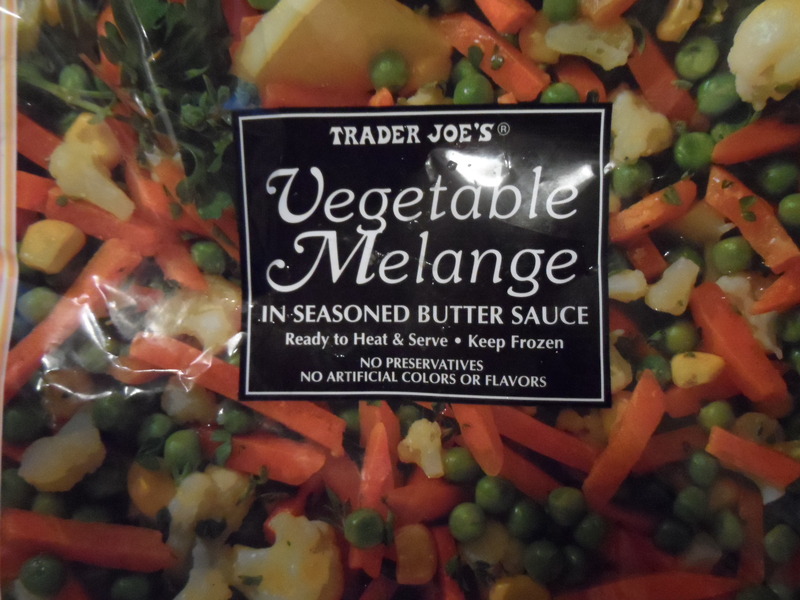 On a lazy day I might use a bag of frozen veggies such as Trader Joe’s Vegetable Melange, cooked in the microwave for twice as long as the directions say, and added after I sauté the onion. 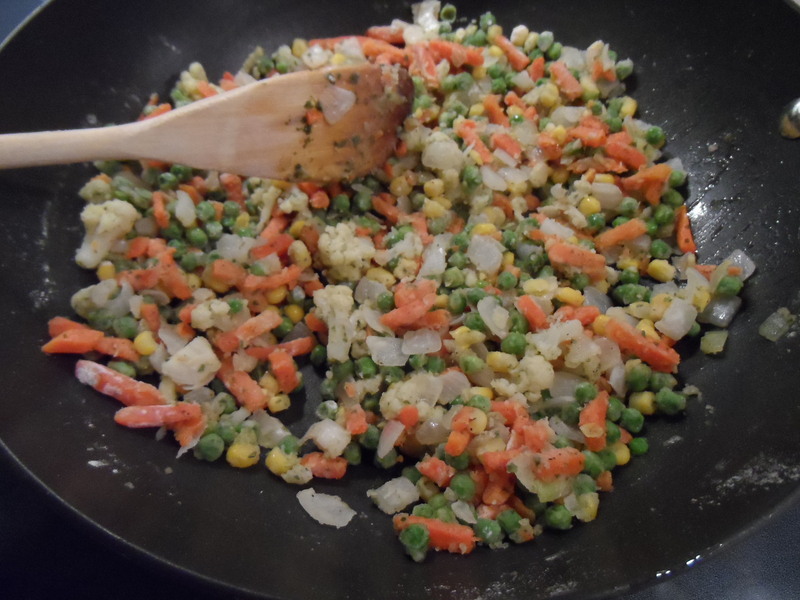 Heat oil and sauté onion, peas, carrots, and potato or cauliflower until tender. 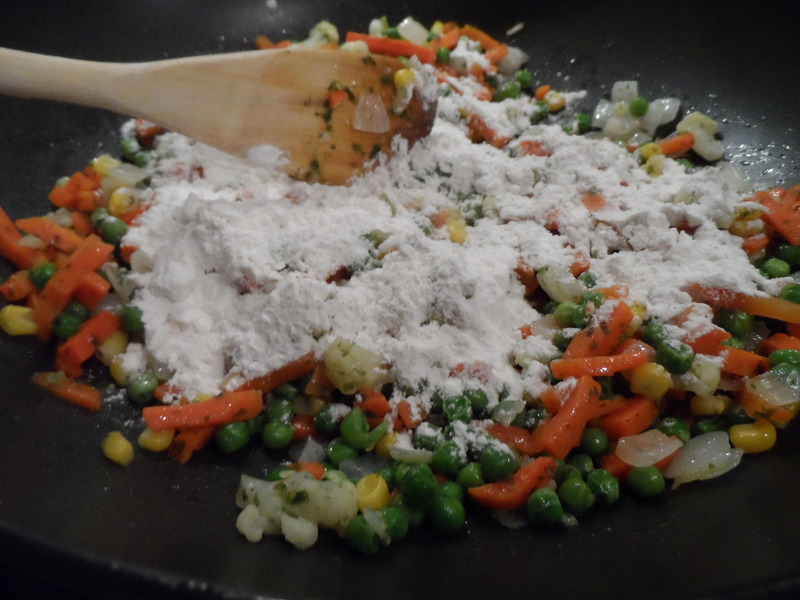 Stir in flour, salt and pepper and mix well. 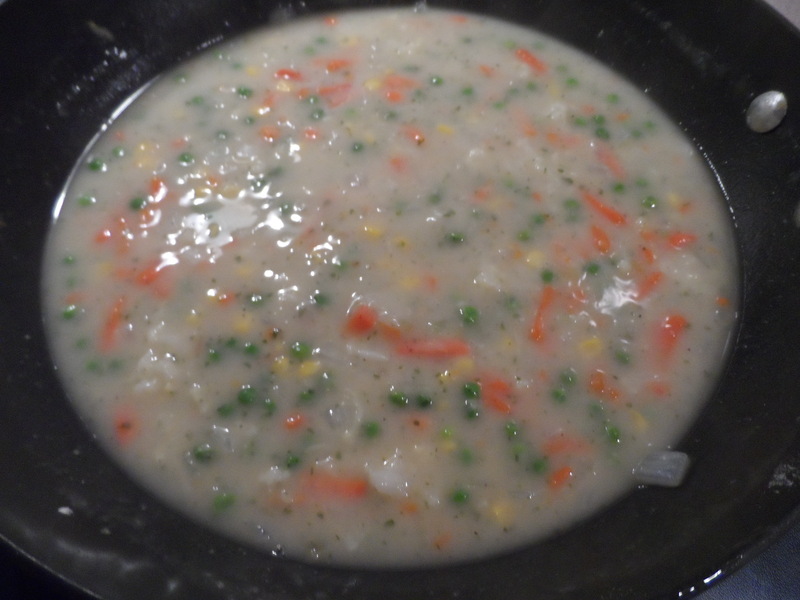 Gradually stir in the broth, stirring constantly to make a thick, creamy sauce. 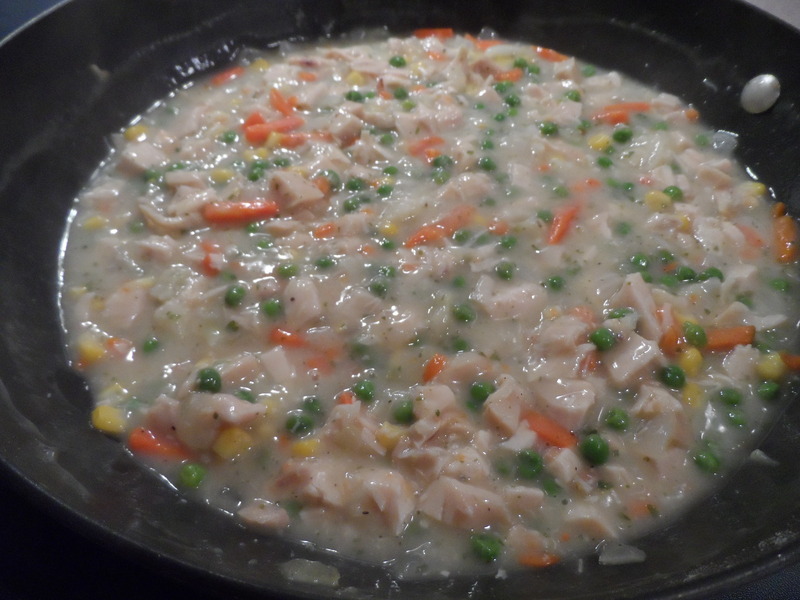 Add diced chicken and stir to combine. Preheat oven to 400°F. Let the filling cool for a bit while you prep the crusts. 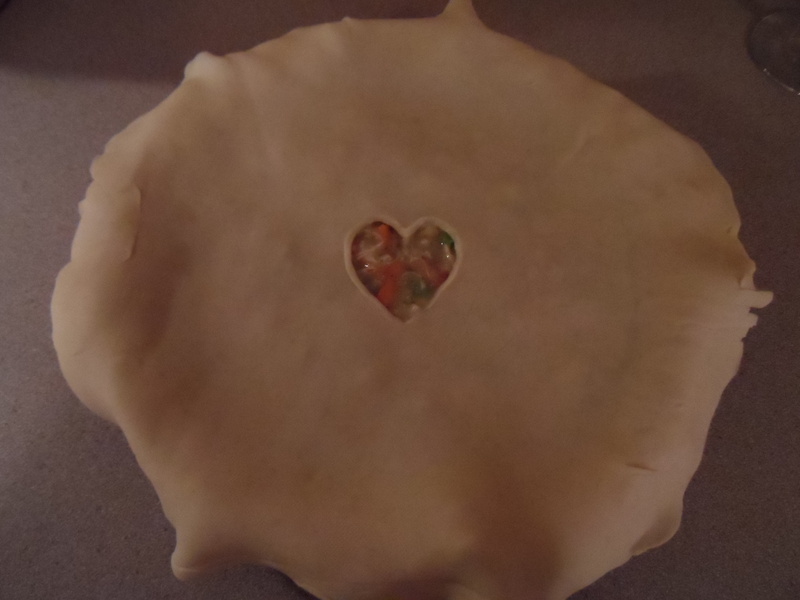 Roll out both pieces of dough and place one in the bottom of the pie dish, letting it hang over the edge a bit. Set the second piece of dough aside. 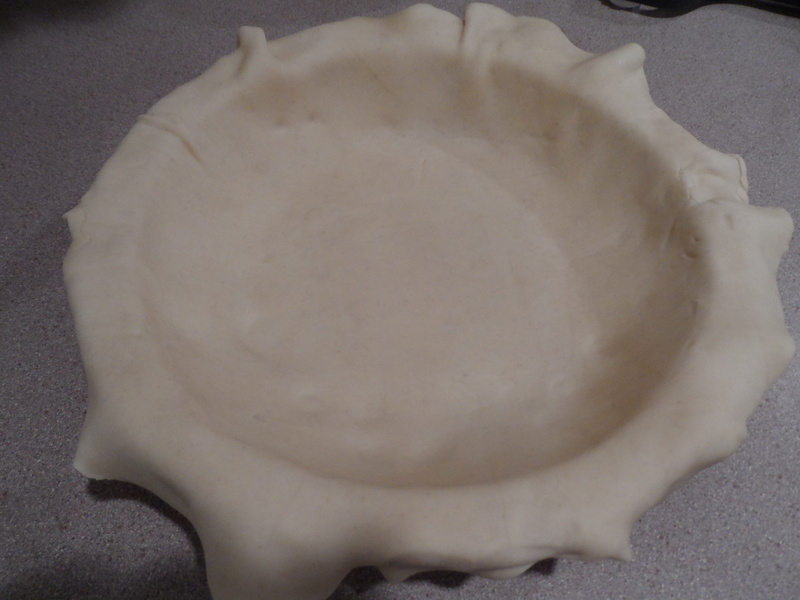 Pour in the slightly cooled filling, and cover it with the second piece of rolled out dough. 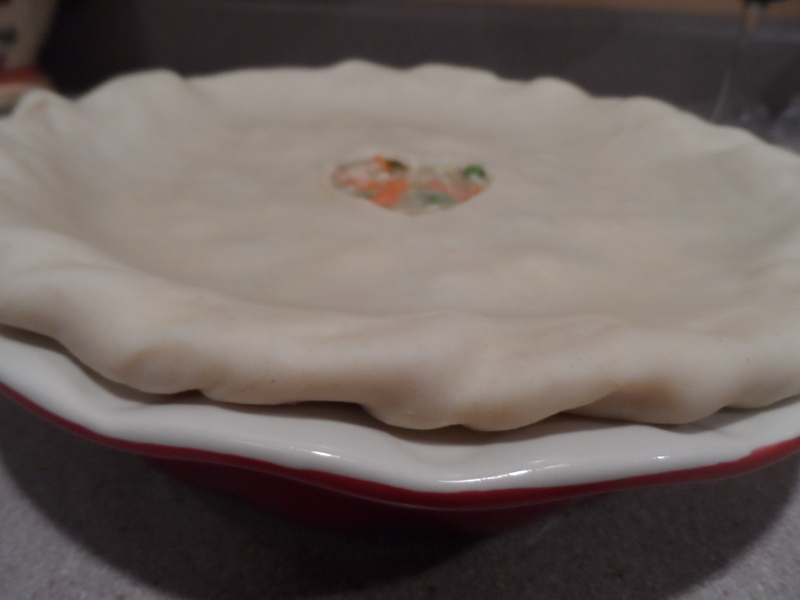 Pierce the top crust with a fork to vent, and tuck the edges of the crust under to make a neat edge. Bake for 30 minutes, or until crust is golden. 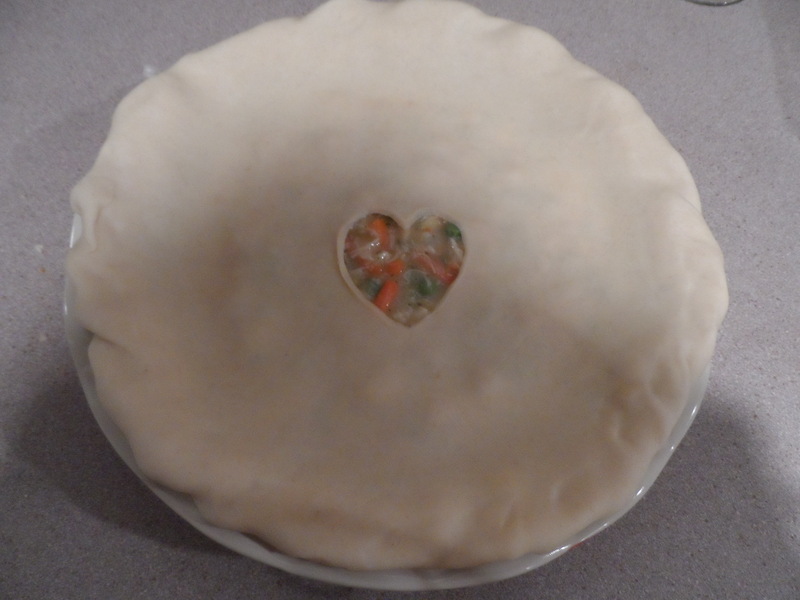 Let stand for 15-30 minutes to let the filling thicken a bit before you cut into it. It started back in 1995 when I first met Jesse—being in love suddenly made me want to cook. Although I loved to cook, there was no real point to it since I lived in NYC and considered all of the restaurants in town my own personal pantry. Instead of opening the door to the fridge, I would open the front door to my apartment, and there were a multitude of cheap great eats to choose from. But on Valentine’s Day 1996 something in my universe shifted. I had an idea, and as goofy as I knew it was, I knew I had to do it. 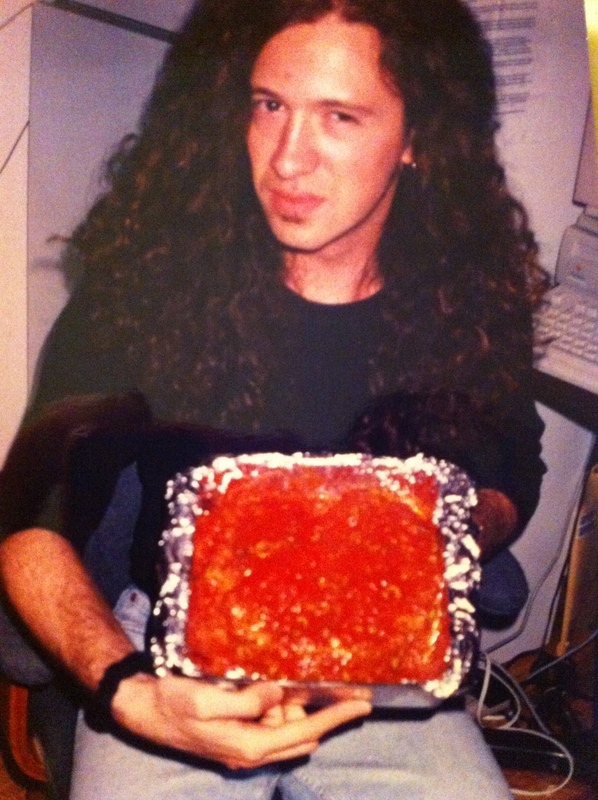 I made my super- cool, crazy-handsome, rocker husband-to-be a heart shaped meatloaf. If this isn’t love, what is? When I pulled it from the oven I channeled my best June Cleaver, my inner Marion Cunningham, and even my own wonderful mom. Meatloaf to me means more than just that you love someone, it means that you are a family. 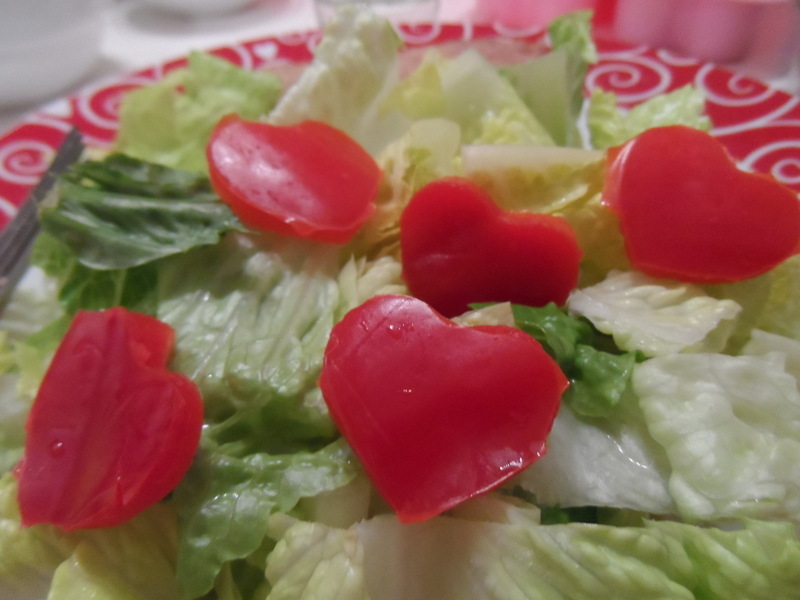 Well, all these year later, I will be keeping with the tradition that I started way back when, and will make my 19th heart shaped meatloaf for my love. But now I must make it bigger because there are five of us. You know the childhood taunt, “First comes love, then comes marriage, then comes the baby in the baby carriage.” Well three babies and 19 Valentine’s Days later, we look forward to it as our family V-Day tradition! 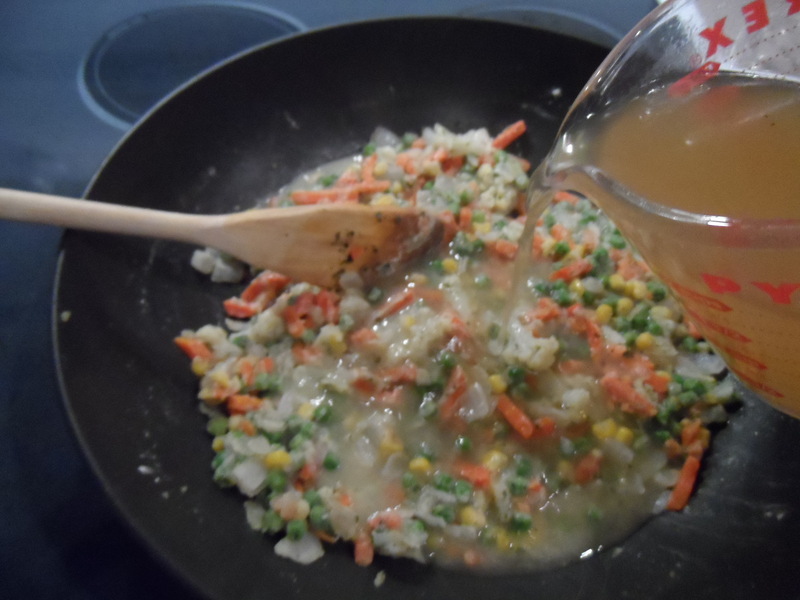 For the glaze mix together: ¼ cup ketchup, 1 tablespoon brown sugar, 1 teaspoon spicy brown mustard and set aside. Preheat oven to 350°F. Line a baking sheet with foil and spray lightly with non-stick cooking spray. In a large mixing bowl, stir together the dry mustard powder and the water. Add the egg and stir again. Add all of the remaining ingredients: ground meat, ground oats, garlic, ketchup, salt, and thyme and stir with a wooden spoon until well combined. 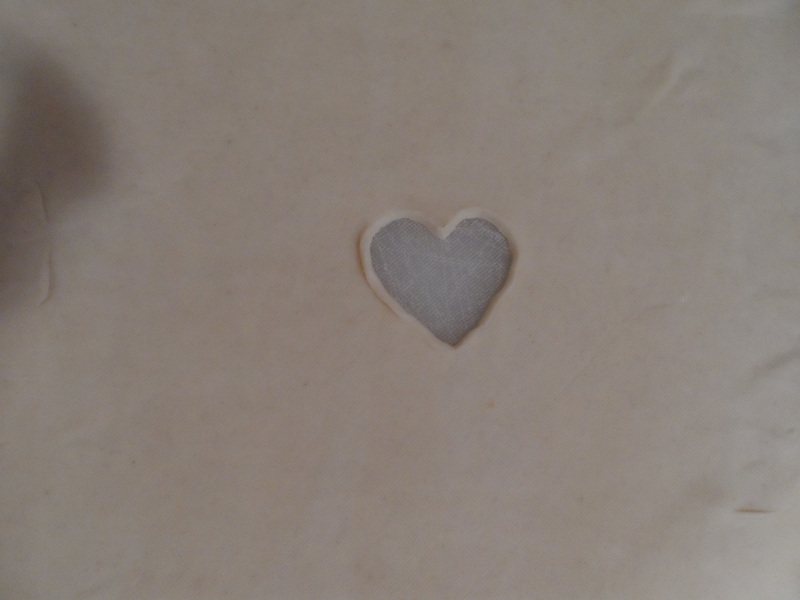 Transfer the meat mixture onto the prepared baking pan and using your hands, shape into a big, wide heart, smoothing the top. Bake for 30 minutes, top with the glaze, and return to the oven and bake for another 30 minutes. Let stand 10 minutes before serving. Serve to someone, or a few someones, that you love. Sometimes you want it, need it, have to have it. Even though it is decadent, you won’t rest easy until the deed is done. It will consume your thoughts, until you consume it. And you can go out of the house to get it, or you can get it at home. No, silly, I am talking about Penne al a Vodka, the ultimate cream-based pasta dish. The secret to delicious restaurant cooking is that they add way more butter-cream-salt-sugar-oil than you would ever dare to do at home. You are pretty much paying someone else to NOT tell you how much fat-salt-sugar is on your plate. These ingredients go directly to the pleasure center of your brain, and helps bring you to the conclusion that you’ve just had a great meal out. It’s cheating, actually. This restaurant “don’t ask don’t tell” policy is universal. Unless you go with my mom, then she interrogates the waiter until he goes back to the kitchen and asks the chef EXACTLY what is in the dish and in what amounts. But not me–if I am eating in a restaurant, and not eating sushi or a salad, then I want this pure primal fat-salt-sugar hit, and I don’t want to discuss it. When cooking at home, I wouldn’t dare add as much fat-salt-sugar as they do in a restaurant. I am conscious of keeping things healthy for my friends and family with the “special occasion” clause, otherwise known as a “treat.” Once in a while I will make this Penne al a Vodka for that at-home restaurant fat-salt-sugar hit, and I tell myself it is still slightly better for you than anything at the local Italian-American Pasta Restaurant. In fact, this recipe is so good, that we would never ever think to order it in a restaurant anymore because it is BETTER. Now, I know you think I am always telling you, my loyal readers and fellow foodies, that my recipe is BEST. But I kid you not, once again, this is not just good, not just better, but the best. As my grandmother used to tell me, “Good better best, never let it rest, until the good is better and the better best. “ And this recipe my friends is, the best. 1. Bring a large pot of water to a boil and cook penne according to package directions. 2. Meanwhile, in large sauté pan heat the olive oil over medium heat and sauté the onion until tender. Add the minced garlic and cook for about a minute, keeping the garlic moving in the pan. 3. Add the vodka and crushed red pepper and cook until the vodka is reduced and seems to disappear. 4. Add the tomato sauce and bring to a simmer. Stir in the cream and the parmesan cheese and stir well until incorporated into the sauce. 5. When the pasta is finished cooking, drain and add it to the sauce and mix well. Add the fresh chopped basil and serve hot. Enjoy! 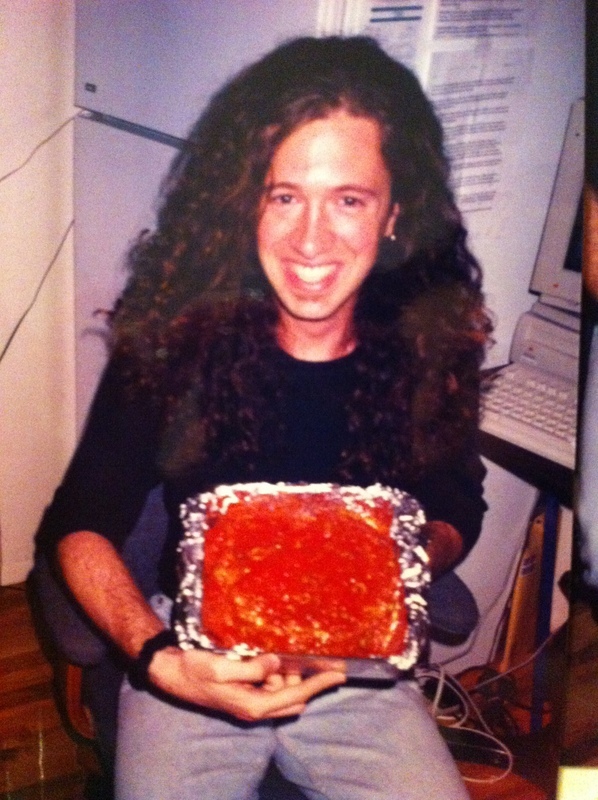 Talk of eating Spaghetti Bolognese has been going on in my house for days. My boys are reading a book called The Uglies in which a character named Tally goes on a treacherous journey and packs 41 packets of instant Spaghetti Bolognese. Even though by the end of her trip Tally is sick of it, the Spaghetti Bolognese comes up again and again, causing my boys to clamor every night to eat some, clutching their empty grumbling bellies and crying out for Spaghetti Bolognese. I didn’t remind them I made it twice last fall—a delicious recipe from Epicurious that everyone liked—but there was nothing to help them remember it. It was eaten, swooned over, and, no sooner than the dish hit the sink, immediately forgotten. But thanks to this book, The Uglies, it has been an obsession all week. I can whip up a meal with nothing but the scraps in the veggie crisper and some jars in the cabinet, and for company at that. I had the ingredients for a faux Bolognese and my boys didn’t know any better, thanks to short term food memory. But when it was done, I realized that what I’d made tasted just as good as, and maybe better than, the original, complicated recipe—and I didn’t have to spend 2 hours in the kitchen stirring. The first thing you should do is open a bottle of wine. Maybe this is how you start cooking every meal anyway. An inexpensive red would do (head to Trader Joe’s), something appropriate for a Thursday no-company sort of night. You are going to use only a little bit of wine for the recipe, so pour yourself a glass—might as well get this weeknight non-party rolling. Besides, it will make helping with homework a little easier. Take a sip and you may notice immediately that the kids’ voices seem softer and further away. And by voices I mean whining, crying, screaming, fighting. If this isn’t your household skip ahead to the next paragraph. If it is your house, pour a little more wine—you only need 3 tablespoons for this recipe. By the way, I’m not saying if it is my house or not. Begin cooking now. Put up a pot of water for the pasta. You can use any kind of long noodle you have. Trader Joe’s has taglietelle, which I love, but feel free to use linguini or spaghetti, and when the water boils, salt the water well. Once the stress of your day starts to melt away, you will begin to hone in on the smell of the olive oil: green, deep; the onions: sweet, savory; the garlic: buttery, warm; the thyme: earthy, strong. Brown your ground chicken (or any ground meat you’d like), add the luscious tomato sauce (see previous my blog, Getting Sauced), and simmer away. When this comes together, the sauce simmering simultaneously with the pasta boiling, it will transform your Thursday night supper into something special. So, pour some more wine for you, put out extra grated parm for the kids, and enjoy. And you never know what treasures your kids’ book hold. 1. 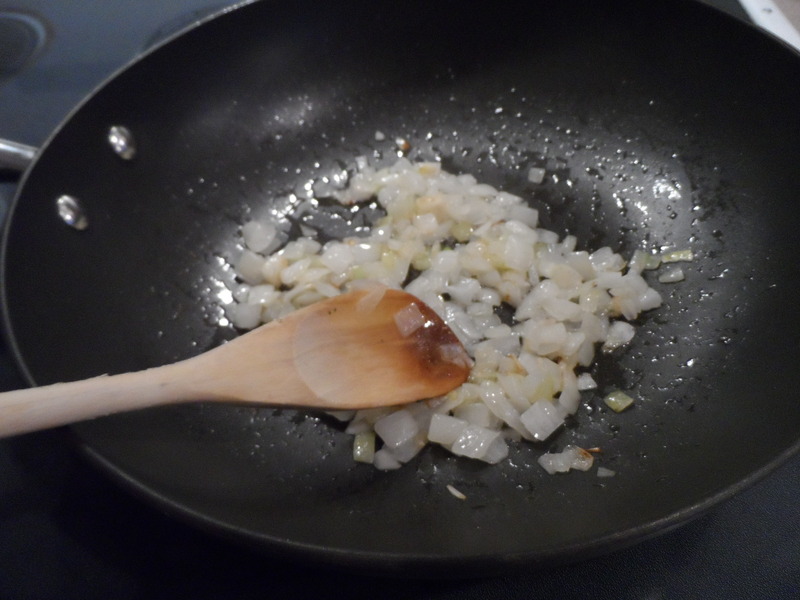 In a large pan, heat the oil and cook the onion over medium-high heat until tender. 2. Add the garlic and cook while stirring for one minute. Add the wine and cook stirring for 2 minutes. Add the ground chicken and cook until browned while breaking up the chunks of meat with a wooden spoon Add the tomato sauce, salt, pepper, and thyme, simmer for 15 minutes. 3. Meanwhile, cook the pasta according to package directions taking care not to overcook. Drain (it is okay to leave a little pasta cooking water clinging to the noodles), and toss the noodles with the sauce. Serve with grated parmesan-Romano blend or whatever you have handy.